Can you say easy potato recipe? Well, then try this tasty dish on for size. I haven’t cooked with potatoes in a while, not since I made the Grilled Sweet Potato Burgers for a belated 4th of July dinner. 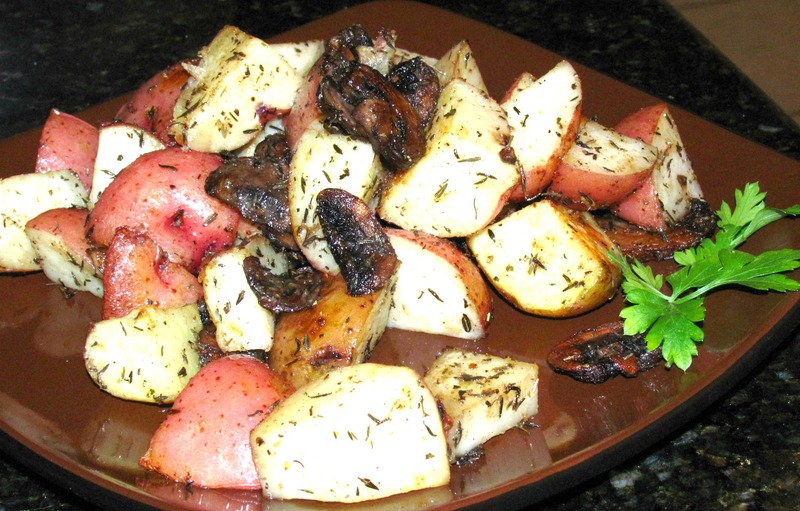 It takes no time to chop the potatoes, season them and pop them in the oven for a delicious dinnertime side dish. Red potatoes are my favorite! Preheat oven to 350. Chop potatoes into 1-inch pieces. Place potatoes and mushrooms in medium/large mixing bowl and add olive oil and herbes, then toss to coat thoroughly. Spray a cookie sheet lightly with non-stick cooking spray, then spread potatoes and mushrooms out evenly so they cook thoroughly. Roast for 20-30 minutes, or until potatoes are thoroughly cooked. Should make 3 one-cup servings.